Higher horsepower means more oil demand. When you're running twice or three times the stock power output, you absolutely have to be sure your engine is getting lubricated everywhere it needs to! Especially if you have an aftermarket oil cooler to keep oil temps down! 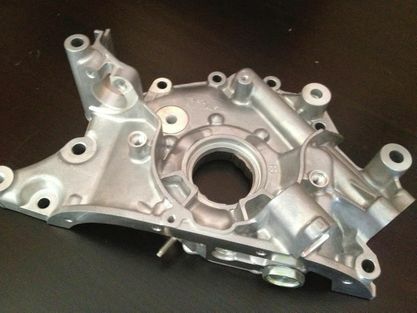 What does SupraStore do to bring you options for a better oil pump? We take a brand new OEM Toyota one, remove all hard edges, radius all corners, enlarge the front main seal drain, and shim the pressure relief valve to give more max PSI. Make sure you get a quality oil pump for your engine, from the professionals at SupraStore! Fits all 1UZ, 2UZ and 3UZ engines.